In recent years, there has been remarkable progress in our understanding of policy persistence, on the one hand, and of the psychological phenomenon of underreaction, on the other. Surprisingly, there has been no attempt to use robust findings, derived from these efforts, in order to understand the nuances of policy underreaction. Policy underreaction refers to systematically slow and/or insufficient response by policymakers to increased risk or opportunity, or no response at all. 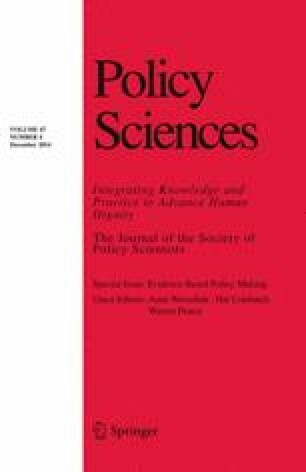 This article tries to give the concept of policy underreaction a robust analytical identity by integrating cognitive, social, psychological and emotional variables in the explanation of policy underreaction and by introducing a variation across different types of contextual sources of policy persistence as explanatory variables of this phenomenon. It develops an analytical framework that revolves around two key elements of decision making in situations of risk unfolding over time: (1) policymakers’ underestimation and accurate estimation of increased risks and (2) intra- and extra-organizational sources of policy persistence. Based on these dimensions, the article identifies and illustrates four distinct modes of policy underreaction which reflect differences in the nature of implemented policy. Earlier versions of this article were presented at the 2013 Annual Conference of the Israeli Political Science Association, Jerusalem; the Political Science Departmental seminar, Hebrew University, Jerusalem; the 2013 International Conference on Public Policy, Grenoble, France; the 2013 Comparative Agendas Project Meeting, Antwerp, Belgium; and the CARR/LSE public policy group seminar, May 2014. I would like to thank Raanan Sulitzeanu-Kenan, Allan McConnell and numerous seminar audiences for very insightful comments. I also thank Eitan Shamir, Yossi Kuperwasser, Ran Segev, Issac Devash and Ron Tira for helpful discussions. I would also like to thank the Policy Sciences editors, and two anonymous reviewers, whose comments and suggestions helped me improve this article. The usual caveat applies. Dror, Y. (2012). The Flotilla as a “Simple Military Operation”, Haaretz, 18.6.2012, In Hebrew. http://www.haaretz.co.il/opinions/1.1733812. Accessed 16 June 2014. Druckman, Y. (2010). Morning of Yom Kippur War: Cabinet rejects call for preemptive strike, Ynet Magazine. http://www.ynetnews.com/articles/0,7340,L-3965041,00.html. Accessed 16 June 2014. Maor, M. (2014b). Policy anti-bubbles: Policy underreaction and self-sustaining processes. http://papers.ssrn.com/sol3/papers.cfm?abstract_id=2441670. Accessed 16 June 2014. U.S. Government Accounting Office (GAO). (2009). Financial markets regulation: Financial crisis highlights need to improve oversight of leverage at financial institutions and across system. http://www.gao.gov/products/GAO-09-739. Accessed 16 June 2014.